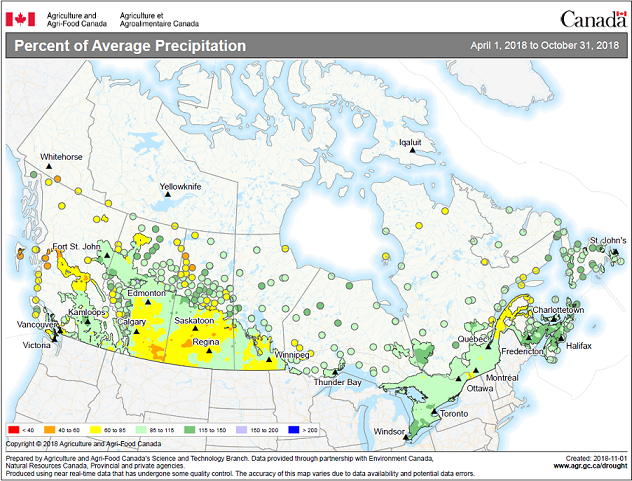 The title of the map is "Percent of average precipitation from April 1 to August 31, 2018 (during the growing season), compared with the annual average, by province"
The title of the map is "Percent of average precipitation as of April 1, to August 31, 2018 (during the growing season), compared with the annual average, by province" This map shows precipitation below normal through much of British Columbia, below normal in central and southern Alberta and Saskatchewan, and below normal in southern Manitoba. Precipitation conditions in southern Ontario were above average while conditions in central Ontario and much of Quebec were close to average. Precipitation in the Atlantic Provinces was above the average.